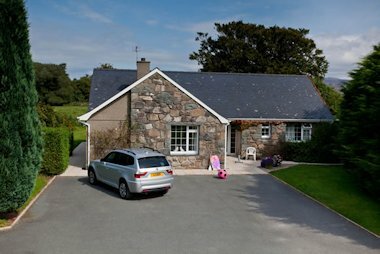 Rhos Country Cottages are situated 4½ miles inland from the 'castle crowned' town of Criccieth, with its two beaches divided by the headland, on which sits the 700 year old castle. Nearby is the village of Llanystumdwy, the boyhood village of David Lloyd George with a Museum and film on one of the greatest British statesmen of the twentieth century and the Victorian Cottage where he was raised. The cottages offer "Olde Worlde Charm & Character", with old oak beams, ingle-nook fireplace with real log fires, antiques and lovely country furnishings. With every ‘home from home comfort’, some even have a Four Poster Bed, own Snooker Room, own Private Sauna, or own Jacuzzi Bath. The cottages can sleep from 2 – 8; in two, three or four bedroomed properties with cots and high-chairs available on request. There are Elegant Victorian Beds and romantic bedrooms - ideal for honeymoon, anniversaries, birthdays and any special occasion.